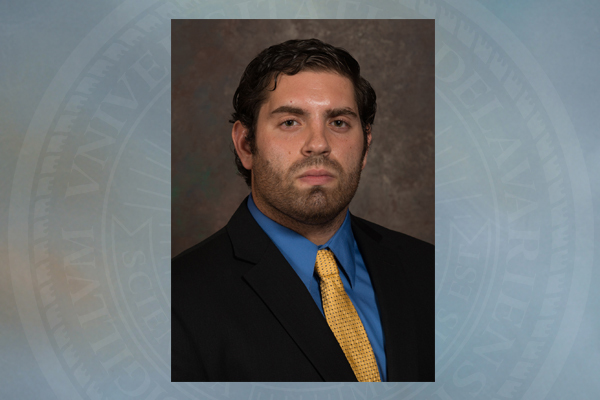 12:51 p.m., Feb. 1, 2016--The University of Delaware football family is mourning the loss of former Blue Hens offensive lineman Christian Marchena, who was killed in a traffic accident on Thursday morning, Jan. 28. He was 22. Mr. Marchena died when he lost control of the car he was driving on an icy road in Salem County, New Jersey, and crashed into a tractor trailer, New Jersey state police told NJ.com. The accident occurred at 8 a.m. on Straughns Mill Road in Oldmans Township. Mr. Marchena, who was driving a Honda Civic, was pronounced dead at the scene. A native of Hazlet, New Jersey, where he attended Raritan High School, Mr. Marchena was the son of Jose and Grace Marchena. He was a four-year member of the Blue Hens squad in 2011-14 and played in four career games as a backup offensive lineman. An honor student, Mr. Marchena earned his degree in electrical engineering in 2014 with a minor in sustainable energy technologies. He was a Dean’s List student, was a three-time member of the Colonial Athletic Association Academic All-Conference team, and earned the Newark Elks Club Scholar-Athlete of the Year Award in 2014. He earned All-Shore honors at Raritan High School and led team to the Central Jersey Group 2 semifinals in 2009. He also competed as a shot putter and discus thrower in track and field. A funeral mass will be held Tuesday, Feb. 2, at 9:30 a.m., at Holy Family Church in Union Beach, New Jersey. For further information and condolences, visit www.laurelfuneralhome.net.